You’re still here? It’s over! October 1, and there is still hummingbird action in the woodland garden. Prior years had fall storms and hurricanes bringing the torrential rain and wind, and that usually meant the end of hummer season. Last year they were gone by September 6th – I can’t recall the storm but it meant they moved south – hopefully without too much harm done. Hummer action was put to a halt, and the flowers they fed on were beaten down and ripped apart by the elements. Right now I still have some cardinal flowers and blue lobelias blooming, providing some sugars and sustenance. By “some” I mean 10% or so – most have gone to seed. But these plants are very successful in the garden, only being upstaged by the common wood aster. 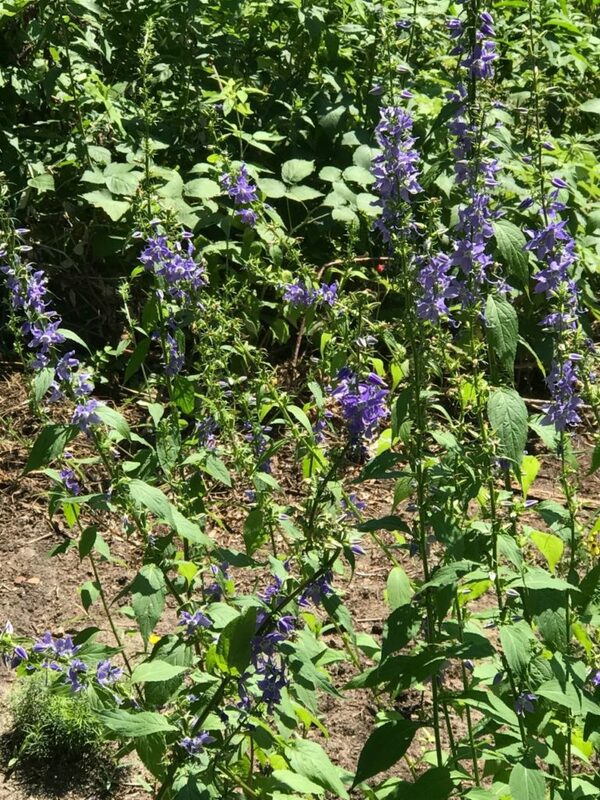 I must have at least 500 or so blue lobelias and cardinal flowers this year (90 to 10 respectively on the 100 scale) – I certainly did not expect this proliferation having started with 5 plants of each species. While in years past I have let nature do its thing, this fall I have resorted to cutting off the seed pods and in some cases I have cut the plant all the way down to the basal leaves. Even then I suspect to see many more Lobelia sp. popping up in the beds and the lawn next spring. Well, it has been here for some time now, but it took some time to heat up this year. The tropical plants on the porch have survived the cool June nights and are now adding new leaves. 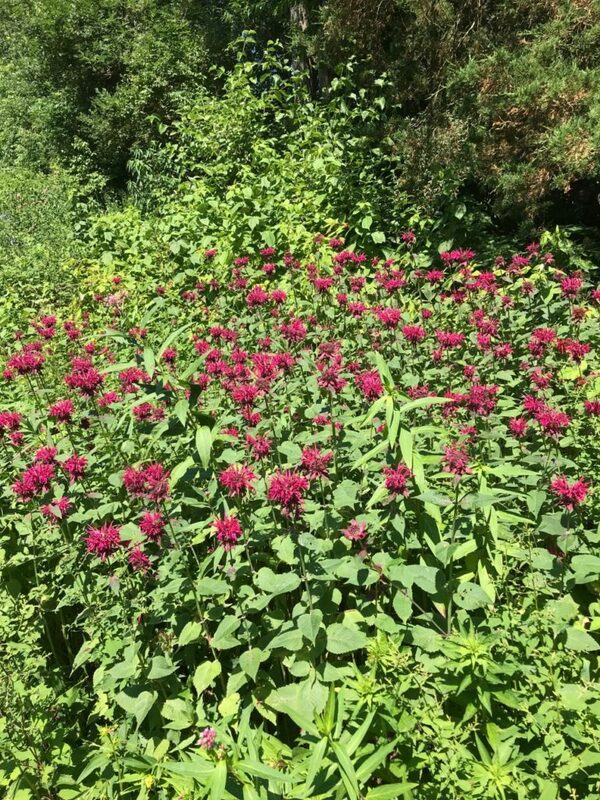 As for the garden, the sunnier spots are in full bloom with milkweed, butterflyweed and beebalm feeding monarchs, wasps, bees and hummingbirds. It’s a matter of days before the perennial sunflowers turn the whole area bright yellow. I shrunk the lawn by another 40% this year and the perennial beds are now several yards in width. I have populated the newly gained land with marsh milkweed, cardinalflower, blue lobelia, and obedient plant as anchoring vegetation, with plenty of room left to fill in next spring. 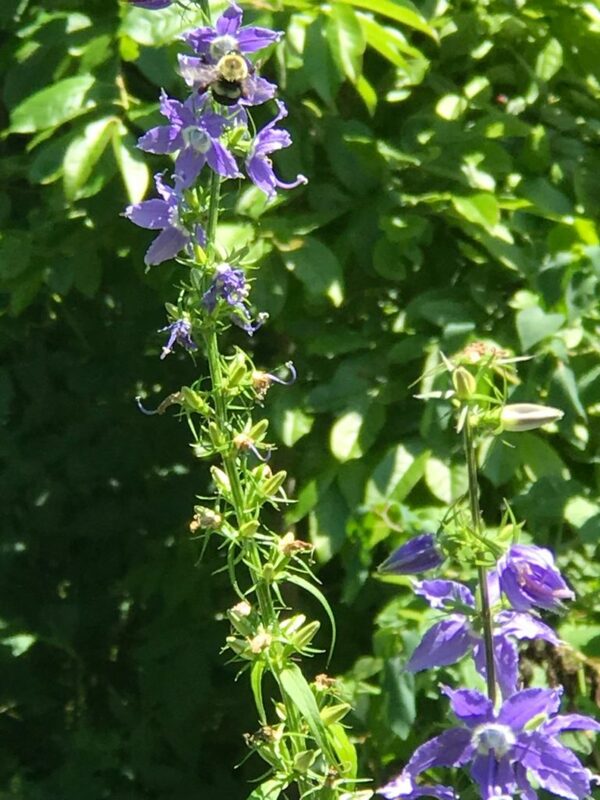 One of my new favorites is campanula americana (american bellflower). I grew it from seed last year but only a few plants survived the slugs. I had totally forgotten about them but they are now 4 feet tall and full of blue flowers. The bumblebees just love these! I hope to get some seed so I can start them up again next year. They are biennal in this area. 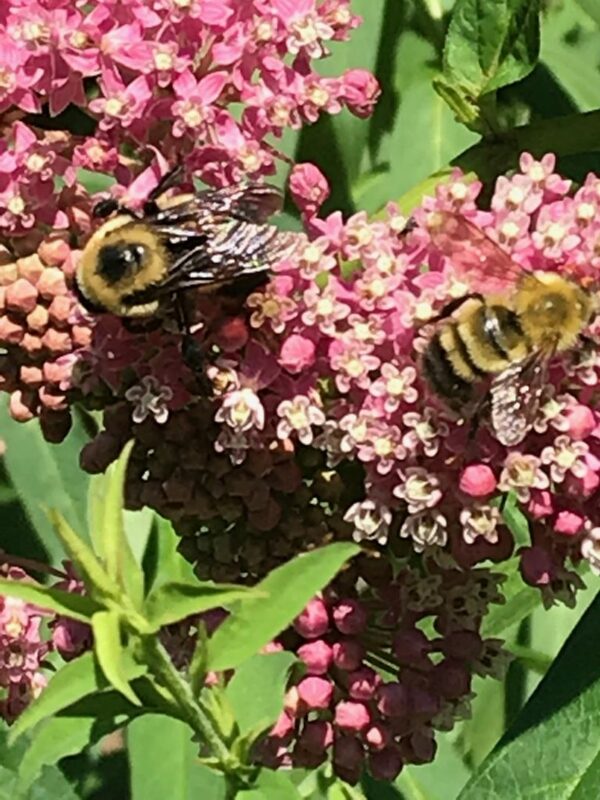 bumble bees on Asclepias incarnata (swamp milkweed). Despite the name, this plant does quite well in dry areas. Since it is so popular with insects, I have plans to add several hundred to my garden. While the flower is somewhat showier than common milkweed, the latter has a much fruitier and amazing smell. One of the flowers of Opuntia humifusa (prickly pear cactus). The plant was given to me by a friend a few years ago, and now I have a little cactus patch with at least 20 flowers. Maybe there will be fruit this year. In the past I have seen chunks taken out by animals, but the cactus seems to weather this treatment well. The fruit, however, may be more attractive as a rodent snack. 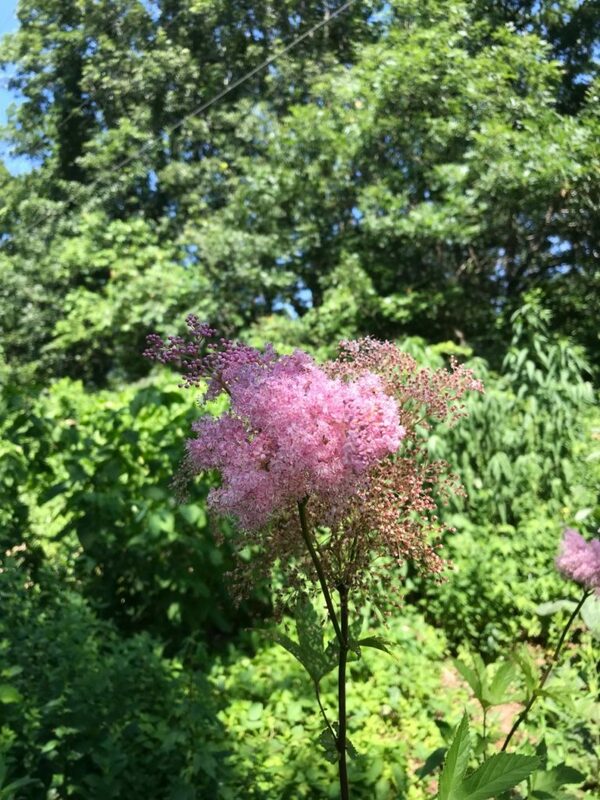 Filipendula rubra, or queen of the prairie – it tends to spread from it’s original location, but I noticed the plant can get outcompeted by taller perennial sunflowers. I have been aiding the queen by weeding somewhat, making sure the leaves get plenty of sun. This Monarda dydima is quite happy to take over whatever space it can find, easily shading out other plants. Make sure to combine it with early bloomers that tend to go dormant anyway, or plants that can stand a crowd. 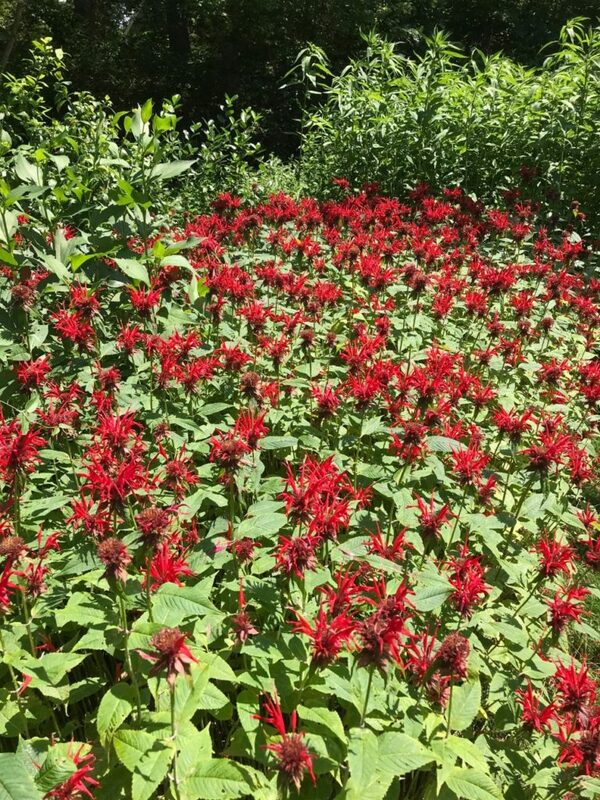 The roots of beebalm are shallow and can easily be dug up and transplanted elsewhere. I planted one 8 gallon pot of this purple beebalm about 3 years ago, and it has taken nicely to its home. 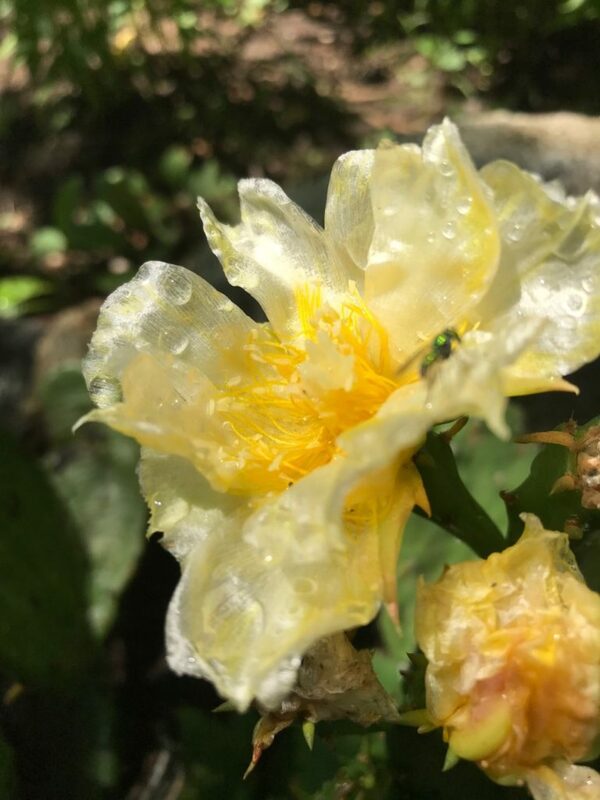 It is not as popular with the hummingbirds (they definitely prefer the cardinal red blooms), but bees and butterflies are quite happy to partake in the nectar. I would also take a look at what the county or your town has in terms of native plants. 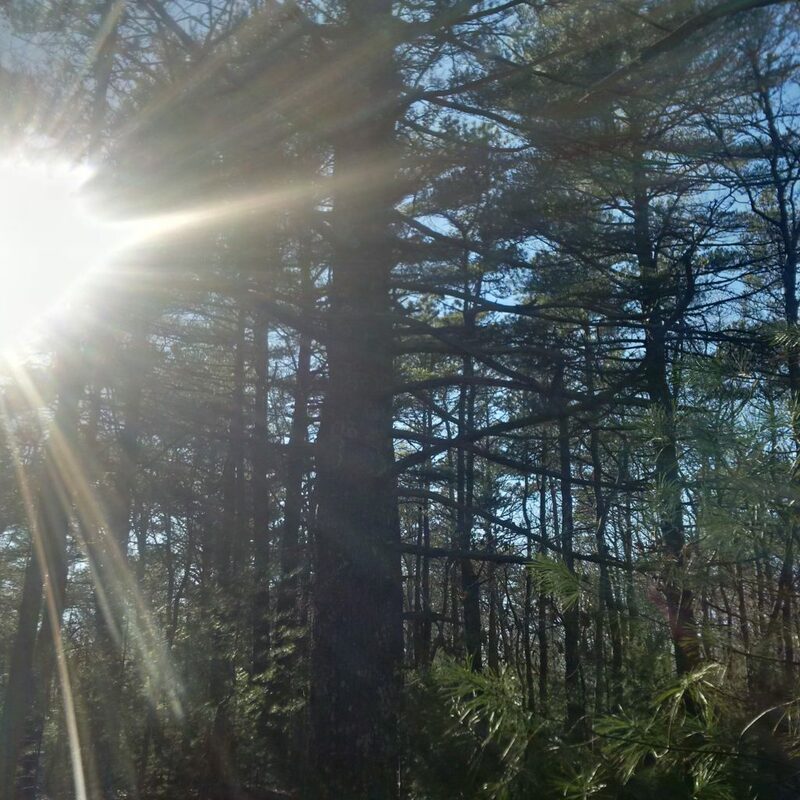 I have had great luck with the Master Gardner Association of Cape Cod (gardeners@barnstablecounty.org) – I obtained many young trees and bushes (i.e. hazelnut, sweet pepperbush, etc.) at very reasonable prices. 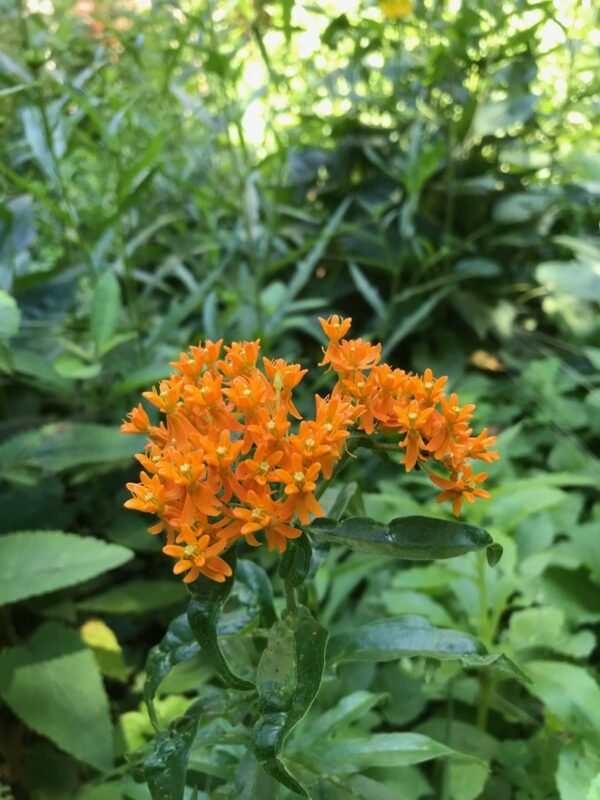 They are not able to provide plant material at all times of the year, but with some advanced planning you can secure native plants for your garden. There is also CL Fornari, who most of you may know from her Saturday morning plant show on one of the local radio stations. 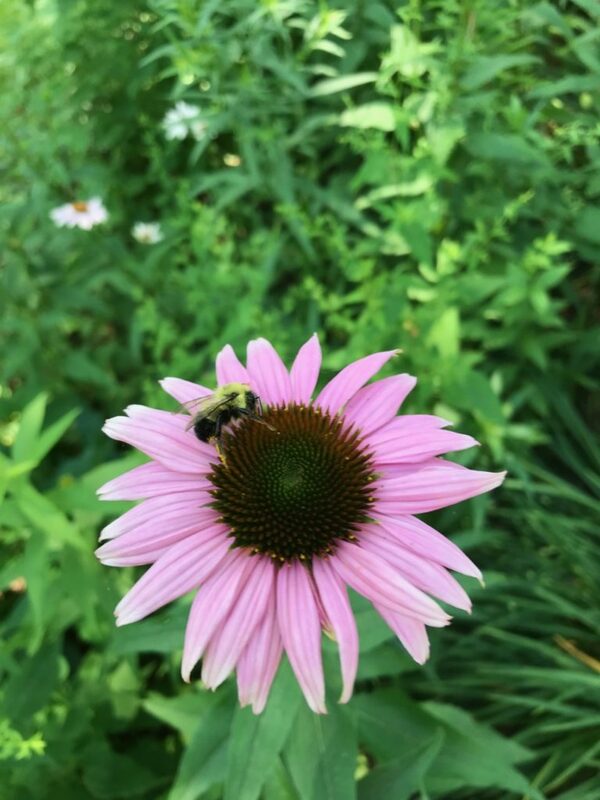 While CL does not focus on native plants (it is a call in show and most callers worry about their vegetables and flowering shrubs), I greatly appreciate the fact that she is chemical averse in her advice, and will do what’s right for pollinators. She also has great advice on trimming and cutting, and she has lived here long enough to know the impact of weather and salt on our plants, including the native perennials we have. When it comes to growing your arsenal of general gardening skills and knowledge, I would definitely give her a listen. I know I am leaving out many other sources, groups and individuals, but I will add links or contact info as I think of it. Now it is time to go into the garden! I am titling this post “winter hikes” not winter walks, because the place on Cape Cod we’ve most recently explored has offered a much more rigorous workout than our previous walks. This walk was yet another one we found in The Nature of Cape Cod by Beth Schwarzman; I am honestly not sure how we’ve missed it to date – since we’ve been using this book as a guide for Cape Cod walks for several years now. But anyway, the site is called the West Barnstable Conservation Area. It doesn’t look like much from the road, but once you get on you really feel like you are in “the woods” as it goes for miles. Schwarzman mentioned you could “get lost”, and at points our first time there we sort of did. Schwarzman failed to emphasize how hilly and rocky it was; every other short path was up (and then down) a steep hill, making the hike feel like a marathon. I would not recommend this hike for anyone who has issues with their knees or walking; I also could see how it might be treacherous if it is icy. Most Cape Cod walks we’ve been on and written about really don’t have that issue. The pain was worth it though, one really felt that you had left civilization on a cold March day. The path we took, starting at Route 149, did not have a lot of signs, so we walked and walked until we decided to call it a day and turn around – eager to check the map and plan our return. We did return, a week later, with a better idea of our surroundings and ended up walking most of the way back directly under the powerlines. The lack of hills made the walk back that much shorter. Forget crossfit, do this walk a few times and you’ll be in shape! Today we returned to this area for our third time. It was a very warm April day, and we entered the path from a different area than we had previously, finding it less hilly but even more remote feeling. There were lots of road signs, and I tried to remember landmarks (fallen trees, stuff like that) so we found it easier to navigate the paths and remember where we had been. The first few times we walked in this 1,100 acre site, we encountered bikers and dog walkers, but today – perhaps because of the out of the way place we entered the path – we were alone. 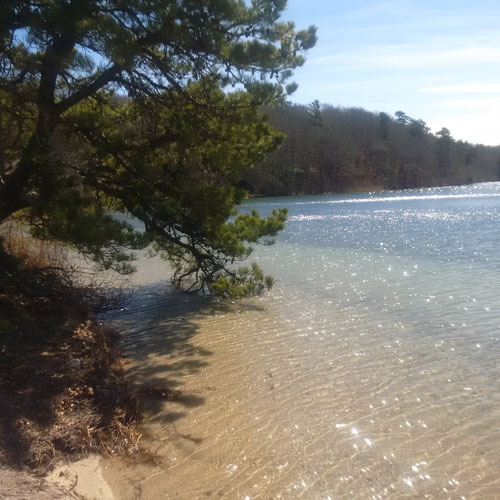 (For the most part, the difficulty of the terrain here keeps casual walkers away, but from what I’ve heard from locals it is a popular mountain biking area so I would expect to see more as tourist season arrives on Cape Cod.) Schwarzman mentions that although it might not be the forest primeval, this “large area of unbroken woods can give you a sense of what this country looked like before Europeans arrived”. The huge very old pine trees you’ll encounter here are truly striking, add to that a few hundred holly trees and together it creates a pretty lush green atmosphere – making me forget for a while where I was – Cape Cod in April – which offers pretty much a barren winter landscape this time of year. We plan to return soon, as there are still many areas to explore and find on these paths. It’s been a while since I contributed to the blog. Blame it on lack of time, or not finding the muse, who knows. It was not for lack of floral display or animal behavior in the yard. Sometimes you just don’t feel like doing something, and there is no exact timeline for regaining your appetite. This year we broke up our usual winter pattern of enduring whatever weather comes our way, and we spent some time in Costa Rica. I can get used to the 80s and 90s, let me tell you – even the humidity stops bothering you after a few days. We were there at the end of dry season and some of the countryside on the Pacific side that did not receive rainfall or is not near water looks like our New England winter with leafless trees, However, even on that side of the continental divide there is still a lot of lush green and color by means of flowers and birds in the cloud forests. Of course, there was still the wet tropical forest on the Caribbean side, where the dry season means it only rained twice that day. I don’t want this to be a travel summary, but it was nice to pretend to be a snow bird and come back to relatively mild, somewhat spring like weather. I missed the peepers this year, they were already out and about in their choirs and solo performances when we arrived back from our trip in the middle of the night on April 2. A day later than planned, as our flight was overbooked by the airline (not United). We were not happy as this was fallout from a volcano erupting nearby some 4 days earlier – flights that day were cancelled and that started the dominoes falling. We settled for another uneventful night at a hotel near the airport. If the event at United Airlines had occurred a few weeks earlier, we could have taken that example and opted for another approach. I did not miss any first native bloomers, though, as the first flower did not appear until April 12. We did have some cold stretches late in the winter, but I was surprised it was this late. Order was restored, however, as rue anemone (Thalictrum thalictroides) emerged first, beating american globe flower (Trollius laxus) by the better of half a day. These plants are obviously not representative for the whole of their species, as many rue anemonde are still barely emerging from the surface, and other american globe flower plants will surely beat them to the punch. Not exact science, just a little private bet I have with the native plants in my yard. There have been some other interesting sightings since our return. A nuthatch pair have taken residence in one of the birdhouses. They picked the one nearest the bird feeder and the bird bath – prime real estate. They have been fairly aggressive at the feeder toward chickadees and other similar sized birds, so it was not unexpected to see that they got first dibs on the new dwelling. The male spent considerable time and effort hammering out a bigger entrance. I am not sure what their reno budget was, but they have already started bringing in nesting material. Bluebirds have been coming to the feeders in amazing numbers – Until this spring, I only saw the birds once in a while in other people’s yards or in the field somewhere. 4 to 8 birds (likely pairs) have been faithful attendees, especially at the suet feeder. They will likely soon move on further north, or they will disperse and find nesting locations. Just the other day I saw a brown squirrel in the trees next to my yard. I have seen them in the woods on Cape Cod before, but they are still a fairly rare sight, and I understand they are under some pressure from grey squirrels taking up territory and pushing them out. The brown squirrel came back today, and he obviously did not get the memo – he or she was displaying aggressive behavior toward a few grey squirrels and actually chased them off on a few occasions. I am assuming that the brown squirrel is nesting nearby and will not easily give way to the bigger grey adversaries. By chance we drove by Chapin beach in Dennis today, and decided to walk on the beach. Much to our surprise there was a pod of 6 or 8 right whales not even 100 yards from the surf swimming by. They were close enough for us to hear the sound of them exhaling water through their blowholes. Only 525 are left in the world, and it was sad to hear about the juvenile found floating dead the other day. The cause of death is unknown at this point, but a boat strike was suspected. When I saw this pod surface around a fishing boat equally close to shore I was a bit worried, but it seemed that the crew was well aware of their submerged company and they were moving slowly. Now I can take this off my bucket list. We recently got a new pet, and he is far more interested in animals than our previous pet was. We don’t let him run around the yard without a leash with concern that he would devastate the wildlife we are trying to cultivate (or become a victim of wildlife himself). However his keen eyesight and interest has given me chances to see many more animals in my yard than I had seen previously. For example, a couple months ago, my pet was intently staring out the window. When I looked to see what he was gazing at I saw two beautiful large deer in the heavily wooded area between my yard and my neighbors yard. More recently my pet was acting really excited in that same part of the yard. I heard a clicking noise and could not for the life of me figure out what sort of animal would make such a noise. I looked closely at the spot where the sound was coming from for quite some time and finally noticed a bat just hanging out and washing himself in the bottom of a tree. I hadn’t seen bats that close since a trip to Central America, so that was really cool. 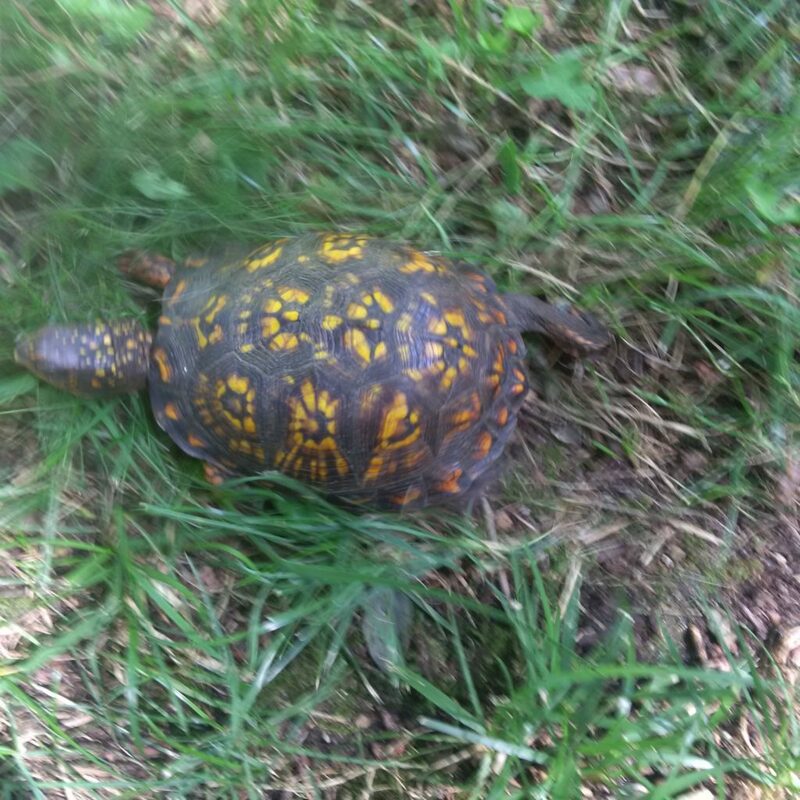 And just a few days ago, my pet alerted me to the presence of a beautiful box turtle, which we promptly moved to a safer part of the yard. We’ve noticed lots more skunks this year – when I see the white stripe I usually get out of the skunk’s way quickly, making sure my pet comes with me. The skunks don’t seem afraid at all, in fact we caught one by mistake in the humane trap we had set for the groundhog and he was more curious than angry. We are thinking that perhaps since the groundhogs are not around this year – skunks – a key competitor – are feeling more safe and comfortable. Earlier this summer I saw my first mink. Two of them were walking near the marsh in Yarmouthport as we were biking by. They were small animals – not much bigger than squirrels – and we had to look them up in a nature guide to figure out what they were. The thought of a mink coat seemed really weird after seeing how wild and small this animal actually is. When I had looked out at my yard in the past generally I would see lots of grass, flowers and trees. 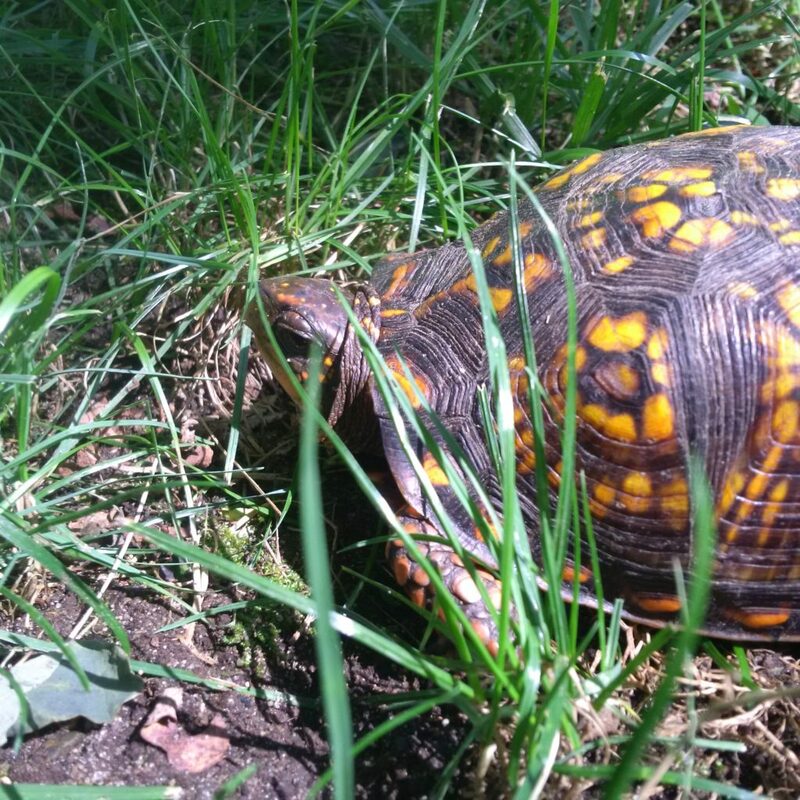 It’s really great that I am now helped by the great eyesight of my new pet, and I am able to be aware of so much more going on in the yard – from box turtles to bats – animals I had only seen in museums, in books or on trips (or sadly sometimes as roadkill on our Cape Cod roads.) 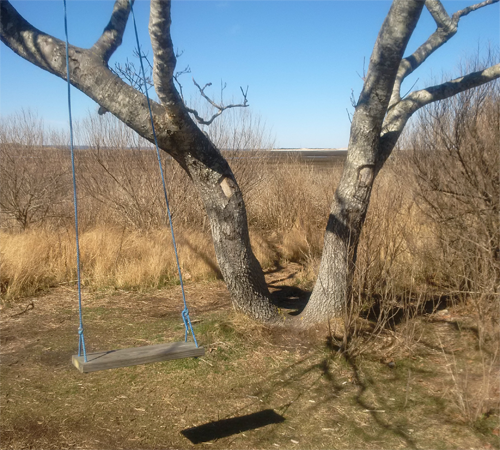 Now when I look out at the yard, I know now there’s a lot more than meets my eye out there, all contributing to the wonderful flora and fauna that makes Cape Cod one of the most wonderful places to live in the world. In the 5 or so years I have maintained this blog I have been keen on logging the first flowering native plant. Every year rue anemone (Thalictrum thalictroides) has been the first to emerge with flowers they usually emerge in early to mid April. I was expecting the same hum-drum consistency and reliability. 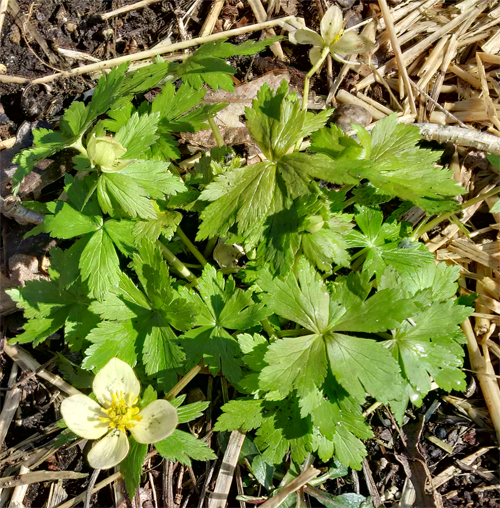 Not this year – even though rue anemone is surprisingly early – I have flowers on them right now, and they unfurled yesterday on April Fools right before the onslaught of the rain that has flooded and ponded the garden today. This year the First Bloomer cup goes to american globe flower (Trollius laxus). I was totally unprepared for this as the tiny plants wasted no time to put their flowers on display March 23 – more than a full week ahead of the competition. The mild winter may have pushed for an acceleration of sorts – other plants are well ahead in the production of basal leaves (common wood aster (Symphyotrichum cordifolium), red columbine (Aquilegia canadensis), virginia bluebells (Mertensia virginica). I also have one trout lily that will likely flower tomorrow – it is so close to opening up… I seem to remember having more in years past, I hope they will still emerge despite seeing heavy foraging and digging by squirrels last fall. In one sun exposed spot foamflower (Tiarella cordifolia) is about to bloom, while the same species in a shaded location has barely sprouted fresh growth. The vultures have been in evidence for a good two weeks, and apparently some ospreys are back, although I have yet to see the pair on a nesting pole down the road. The feathered and beaked displays of spring have come in waves, with different species flocking across the landscape every couple of days. First it was the robins, then the red-winged blackbirds, and just yesterday the grackles were making a familiar ruckus in the trees. The peepers have been putting on concerts pretty much every day for well over a week now. Music to my ears, but probably causing despair to some friends of ours who mentioned a while ago that these little critters were the bane of their existence, affecting their sleep and sanity… I guess it’s true when they say it’s the little things that will get you. Of course, it may all come to a (temporary) halt tomorrow, with cold, snow, and high winds coming through on a fast moving clipper. Either way, time to get out and about! Most of the clearing and planting is finished. I removed some non-native Morrow’s honeysuckle (Lonerica morrowii) bushes that were showing their age and wear, and replaced them with an assortment of serviceberry, summersweet, winterberry, and chokeberry. In year 5 of a 10 year plan the yard is shaping up beautifully. 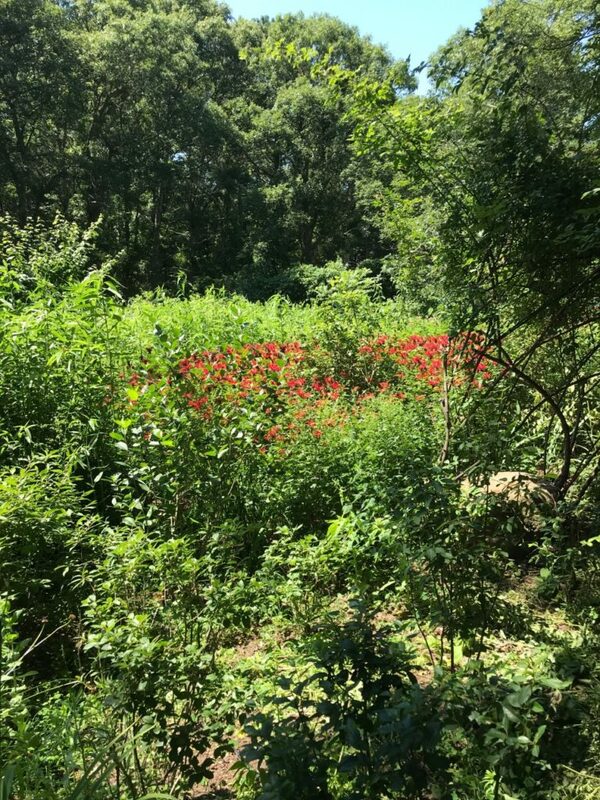 While the honeysuckle bushes provided shelter and privacy, they are not ideal – the berries don’t offer much food value to wild life, and the bushes push out native shrubs and kill off most of the ground flora, including spring wildflowers. Morrow’s Honeysuckle develops its leaves earlier than other shrubs and the leaves stay on well into late fall, early winter. This shrub originates from Asia but has been dispersed throughout woodlands everywhere – I often see it along Cape Cod’s many walking trails.